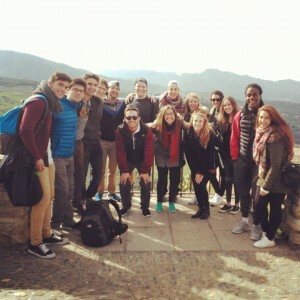 Greetings from Granada! These past days were full of highs and lows. Highs included being accepted into a lovely choir that happens to be singing some of my favorite pieces ever. Lows, I got a horrible stomach flu and was bed-ridden for a week. In case it was ever unclear, being sick in a foreign country is incredibly difficult. But, I am well now! Having been in Granada for a while now, I suppose it is high time I share all about this gorgeous city. The basic facts of Granada: situated in the province of Andalusia, Granada has a population of approximately 472,638. The city is ensconced in the Sierra Nevada Mountains but is also only an hour from the coast in Málaga. 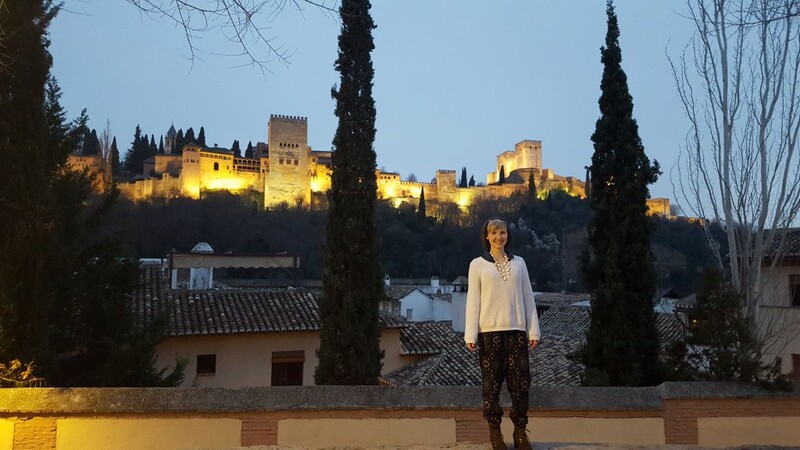 Granada was once a Moorish fortress with its main palace, the Alhambra; therefore, the city is a magical conglomeration of ancient Moorish architecture, Catholic influence after the Inquisition, and modern Spanish architecture. 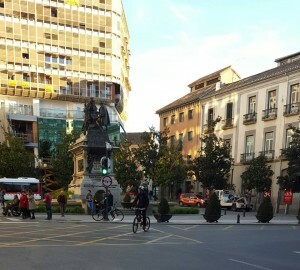 These contrasts are best seen right here, where I go to class: Plaza Nueva. The plaza is sleep and modern with pretty colored buildings. However just passed the plaza you can see cobblestone streets and old reddish stone. This is the district of Granada called el Albayzín. 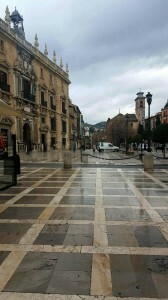 Here is a picture of the famous Alhambra from a little plaza in el Albayzín. Check out the different types of roofs and materials; definitely an older style. I happen to love this area of the city. In general, Granada is gorgeous. All of the sidewalks are tiled and decorative, there are palm trees and Cyprus trees, white mountains can be seen in the distance, there are dozens of quaint plazas and gardens with fountains, landscaping, and vendors. Another fun fact is that Granada literally translates to “pomegranate”! The builders of Granada certainly knew this because pomegranate designs are EVERYWHERE. It makes for a fun walk through the city trying to spot as many pomegranates as possible. 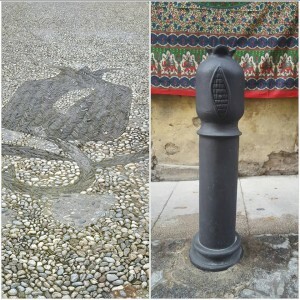 They are on street signs, manholes, cobblestone streets, parking barriers, bowls, buildings and more. Here are just a few I have found throughout the city. Daily life in Granada is surprisingly relaxed though at first glance the streets are in constant motion. Here is a sound byte of Granada’s main street, Calle de los Reyes Católicos. Every day I walk this street from my host mother’s apartment to school. It takes about 20 minutes, and that is considered a short walk! Here is the enormous statue commemorating Christopher Columbus’s discovery of America that I pass on the daily. When at last I arrive to the IES center, I usually have classes from 9:00AM until 2:00PM. Then I walk back home for lunch. Lunch is an enormous meal in Spain. Today for example, we had huge bowls of garbanzo, potato, and carrot soup, chicken and pork, salmon and avocado salad wedges, bread, and grapes. This was a milder-sized lunch! Once you have become with food child, the siesta hours set in. From about 3:00-6:00PM all of the stores and businesses close, and people rest, or in our case, nap. It is a treasured time I must say. After siesta time I usually have an evening class, then around 9:00PM it’s tapas time! For anyone who does not know what tapas are, tapas is a general term to describe a style of eating appetizer-sized portions of any type of food. That is to say there isn’t a tapas recipe because tapas describes the amount and style of food, not the type. One of the most favored aspects of Granada is that with any drink you order (be it soda, water, or alcohol), you get a free tapa! Depending upon which tapas bar you go to, dinner can cost you two drinks aka a couple euro. Tapas can range from sandwiches to seafood, stew to paella, and anything else in between. Thus, nightlife is vivacious and delicious. Granada is a city of leisure, a city for contemplation and fantasy, a city where a lover writes better here than anywhere else about the love of his dreams. 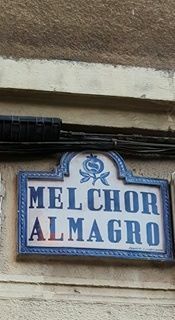 The hours here are longer and tastier than any other city in Spain. It has complicated twilights and constant lights that seem like they will never ever end. I love this quote by Lorca because I think he absolutely captured the essence of the Granada I have experienced thus far. It is leisurely, beautiful, romantic, meandering, and full of the softest and somewhat magical lights bouncing off the mountain peaks. I like my home across the sea.